Bay Gardens Resorts has been awarded St. Lucia's first Green Globe Gold member certification. LOS ANGELES, CALIFORNIA, UNITED STATES, April 4, 2019 /EINPresswire.com/ -- Bay Gardens Resorts has been awarded St. Lucia's first Green Globe Gold member certification. Three of the resort group's five properties have been awarded this global certification for sustainable tourism - Bay Gardens Beach Resort and Spa, Bay Gardens Hotel and Bay Gardens Inn. Green Globe's Gold Member status is awarded to members that have been certified for five consecutive years. This prestigious designation is only possible when a member meets all requisite criteria within the Green Globe Standard for Travel & Tourism (or their sectoral Standard) and have completed the independent and mandatory onsite and desktop audits in alternating years. 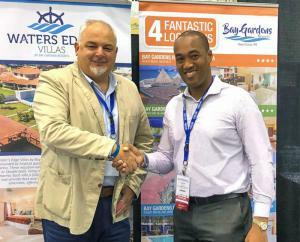 Sanovnik Destang, Executive Director of the St. Lucian family-owned and -operated group of hotels, said: "We are honored and proud to have been awarded this Gold certification. We have always emphasized the importance of environmental protection and sustainability and will continue with our conservation activities in an effort to reduce our carbon footprint." Guido Bauer, Green Globe's CEO, said: "This is a major achievement and we should pay great respect to Bay Gardens' management and staff for protecting their beautiful destination and supporting local communities." Bay Gardens Resorts has phased out the use of plastic in favor of biodegradable vessels and utensils made from wood, paper, compostable plastic and sugar cane bagasse. The company has also ended the use of all Expanded Polystyrene (Styrofoam) products at its properties. It has also embraced other ecological innovations such as installing GEM Link occupancy sensors in its guestrooms, leading to a 15 percent energy use reduction per occupied room. Bay Gardens Resorts' environmental efforts also include converting its air conditioning units to energy efficient inverter units, changing lighting to LEDs across its properties, and implementing a farm-to-table menu that reduces its total food miles. Bay Gardens Resorts is a group of locally owned and operated award-winning hotels all located within, or near, Rodney Bay Village, St. Lucia's entertainment capital. All five of Bay Gardens Resorts' properties - Bay Gardens Inn, Bay Gardens Hotel, Bay Gardens Beach Resort & Spa, Bay Gardens Marina Haven and Waters Edge Villas by Bay Gardens Resorts - are close to more than 40 restaurants, entertainment venues, duty-free shopping malls, Treasure Bay Casino and Rodney Bay Marina. All properties offer comfortable accommodations, traditional Caribbean cuisine, and warm Caribbean service and hospitality. Bay Gardens' Splash Island Water Park, the first open-water sports park in the nation, is a popular attraction off St. Lucia's Reduit Beach.